President Donald Trump defended his former national security adviser, Michael Flynn, during a fiery and wide-ranging news conference Thursday afternoon, saying the retired general "did nothing wrong" and blasting the media for their reporting on the scandal. Flynn "was doing his job. He was calling countries," Trump said of Flynn's conversation with Russia's ambassador to the U.S., Sergei Kislyak. "I didn't direct him, but I would have directed him if he didn't do it," Trump said. Experts say Flynn's conversations could have violated the Logan Act. Trump said Flynn's misstep was misleading Vice President Mike Pence, and others, about the content of his calls with Russia's ambassador to the U.S. during the waning days of the Obama administration. "I fired him because of what he said to Mike Pence." Trump seemed to try and deflect criticism to the press, hitting out at the media for its highly-sourced reporting on the Flynn scandal and on allegations that his campaign had contact with Russian intelligence officials last year. Trump described the press as "out of control" in their reporting of his administration — which he claimed was running like a "fine-tuned machine." He called "the whole Russian thing ... a ruse." What was supposed to be a roll out of his new pick to head the Department of Labor turned into a diatribe against the media and touting the nascent administration's accomplishments, Trump recounting his 2016 win and repeatedly bringing up Democratic presidential nominee Hillary Clinton. By NBC News' count, former Secretary Clinton was mentioned at least nine times — 4.5 times more than the president’s Labor Secretary pick, Alexander Acosta, who earned only two name-checks in the first few minutes of the press conference. Trump revived well-worn attacks on Clinton that he used on the campaign trail, despite the fact that she has been mostly out of the media spotlight since losing to Trump in the November election. Asked directly if he knew if his campaign was in touch with Russian officials during the election cycle, Trump said "nobody that I know of" and distanced himself from the issue. Trump said he was not in touch with anyone. "Not that I wouldn't" call anyone in Russia, Trump said, "I just have nobody to speak to." Angered by leaks dogging his administration, Trump declared news relating to the leaks "fake" and vowed to put a stop to the leakers, who he claimed were leftovers from the Obama administration. "The leaks are real," Trump said. "The news is fake." The president’s gripe was not just with leakers within his intelligence community, but with the “mess” he says he inherited from his predecessor, former President Barack Obama. Amid assurances to fix it, Trump made clear that both “at home and abroad” he was left with “a mess” before moving on to his campaign bread and butter: discussing why he believes he was elected as an outsider and running down a list of domestic and foreign policy issues that need solving - without broaching any potential solutions for these problems. "I'm here following through on what I pledged to do — that's all I'm doing," Trump said. Of his controversial and signature travel ban, Trump disagreed with reports that his travel ban rollout was anything less than perfect. "We had a very smooth roll out," Trump said, despite the ban being blocked in what he termed a "bad court." "The rollout was perfect," the president said. Without offering details, Trump told reporters that a new version of his travel ban would come out early next week and that his administration was looking at a healthcare policy proposal in early to mid March. Trump also defended claims that his win was "the biggest electoral margin since Ronald Reagan." President Obama netted electoral victories of 332 in 2012 and 365 in 2008. President Bill Clinton won with 379 in 1996 and 370 in 1992. And President George H.W. Bush won in 1988 with 426 votes. When faced with facts contrary to his claims, the president laid blame on the information he was given while still maintaining his "was a substantial victory." The president, who often reminds reporters of his experience and knowledge of television and news, ventured a guess as to tomorrow's headlines. 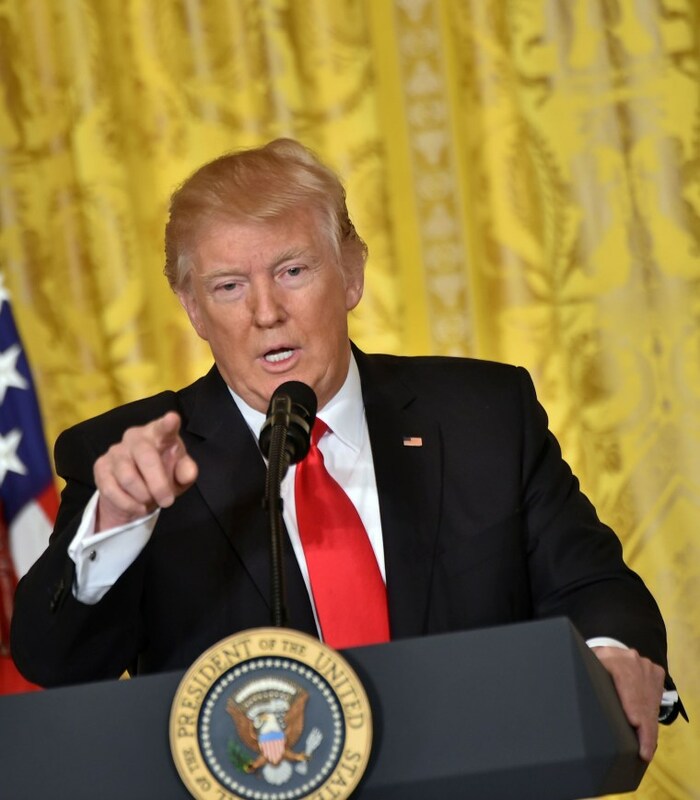 Trump predicted that headlines about him ranting and raving during a press conference would grace front pages. But, he assured, he wasn't ranting nor was he raving. "I love this," Trump corrected in advance. "I’m having a good time doing it."